Led traffic warning lights is a lighting option specifically designed to be mounted onto emergency, construction, or work vehicles. Led traffic warning lights are designed to provide highly visible warning and caution to on coming vehicles when your car breaks down, to approaching motorists of potential hazards and specific directions to motorists, protect your safety and prevent car crash. Led traffic warning light is used as lantern in case of power failure, earthquake, hurricane or other disaster.It is seen in the dark. 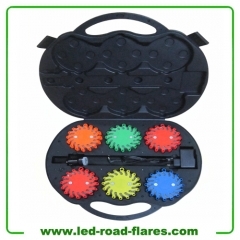 Be bright at night on the road at a construction site or work site. Alert other workers or passers-by that you need help and are under duress when shouting does not help and want help from emergency services. Each led warning light is designed with an easy-to-install assembly for any truck, fleet, or emergency vehicles application. • Made of High Quality PC/TPR Housing and silicone Lens. • Versatile Purposes: For traffic control, Warning Light, Emergency Beacon, etc..
• 360° Coverage with strong magnet base attaching to any flat metal surfaces. • Great for Roof Top, Front/Rear Hood, Car Door, Motorcycle Saddlebag. • Applicable to Most Auto Car Vehicle Automobile, SUV, Pickup Trucks, ATV, UTV Motorcycle, Boat. Completely waterproof even if floats, perfect for boats and watercraft safety. *. Can be seen 500Meter at daytime, 1000Meter at night and 10miles in the water. *. AC wall charger input 100-240V, output 5V 500MA, fully charged within 9 to 12 hours. 1. Safer and ecologically better for our environment then flame style emergency road flares. No spark, open flame, fumes or toxic chemicals are produced when using the LED warning light. 2. Shock resistant construction make the warning light very durable and can withstand the impact of roadside traffic. Can even be run over by a truck and still operate. Used by fire. Police, and other emergency responders. 3. Lie flat or on its edge depending on your reference. Place on the road, on construction sites, vehicle bumper or other surface, and anywhere needing emergency signaling. 4. The LED warning light is waterproof and floats on water so it may be used for marine application and safely in wet environments, including submerged to a depth of 33 feet. Will float unless secured. 5. Using the magnet on the back, attach to any magnetic metal surface. Place on a vehicle, fence, or other metal surface. 6. LED Traffic Warning light will keep a full charge for 90 days. After 6 months, it keeps 70% power; Ater 1 year, keeps 50% power; After 2 years, it keeps 40% power. Press ON/OFF button on led traffic warning light to select the following 9 light patterns. To turn off the led traffic warning light without cycling through the 9 light pattern, just press and hold ON/OFF button for 3 seconds. TWO LEDs will flash five times and then turn off. When ready to operate again, press ON/OFF button to return to the last flash pattern before turning off. 1.Put on led hazard light with front side facing up. The (+) and (-) terminal symbols will be aligned. 3.Connect to power supply, the indicator light will light up as below. Charging: The indicator light aside warning light turns RED and make a Green/Red alternating flash. Fully Charged: The indicator light aside warning light stops flash and keep steady. 2.It is not recommended that you disassemble the led warning light. If it is not reassembled correctly, it may result in failure of the waterproof seal and damage to the unit. Led Warning Light will bring you safe and secure and can be used as follows. • 9. Emergency vehicles to be found, such as ambulance, helicopter landing zones urgently. *Led Warning Light is seen in the dark. Be bright at night on the road at a construction site or work site. Alert other workers or passers-by that you need help and are under duress when shouting does not help and want help from emergency services. LED Warning Light is an ideal signal light to identify Road Hazards, Mark Detours, Underwater Repair Applications And More and A great item to keep in your vehicle at all times that can be used to signal for help or identify road hazards and used for traffic control, firefighters, EMTs, rescue services, first responders, members of emergency response teams and the general public and used in cars, trucks, boats, RVs, semi-trucks, construction zones, and emergency response vehicles.